Wall of windows! An optical illusion. | So Pretty is as Pretty Does. 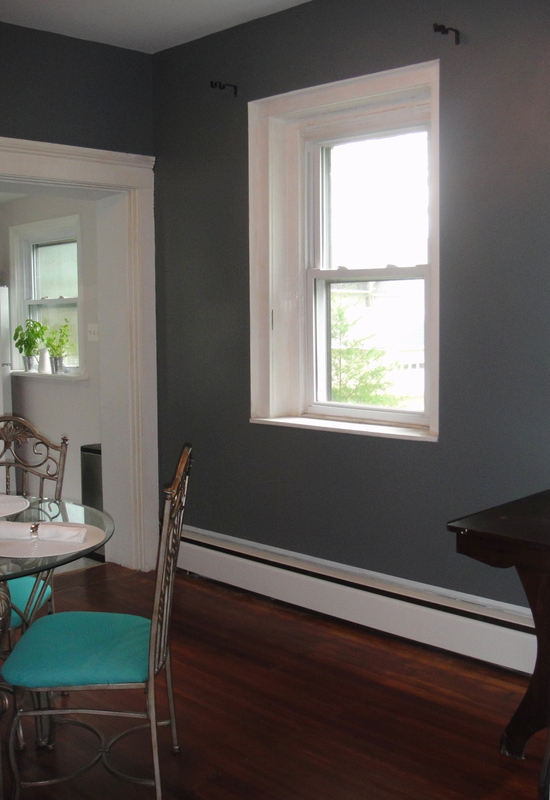 Ordinarily, my husband would replace this window and build the trim, but we’re thinking about putting french doors here in a few years and we didn’t see the point in doing all that work, only to rip it down. So, these curtains are acting as a lovely band-aid. Side note: If you don’t recognize those turquoise chairs, you can see their transformation here. 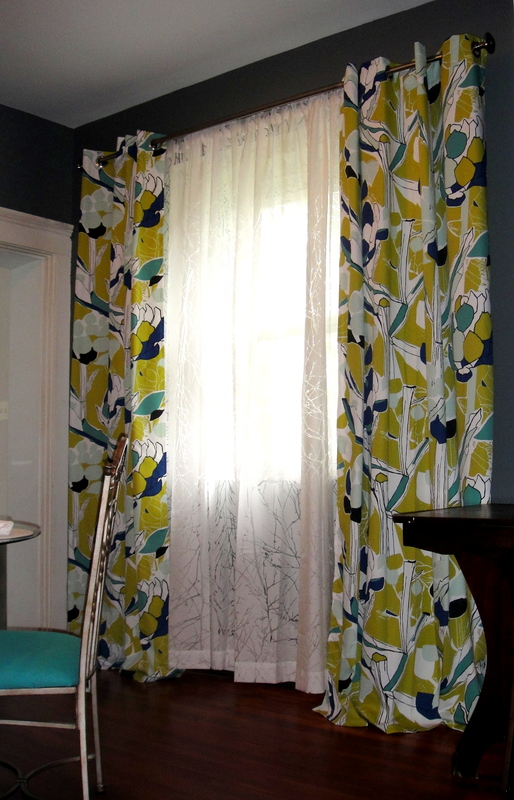 I used a double rod bracket and layered two sets of curtains. I got the sheer curtains, sans valance, at Bed, Bath and Beyond and the cool graphic curtains at Ikea which were very affordable, but sadly don’t seem to be available on their website. I love that the branches in the sheer curtain complement the bigger branches in the graphic curtain, while still not exactly matching. I ran the curtains several feet beyond the frame of the window and centered it with the wall. Now, I have the wall of windows I wanted and the symmetry my brain craved – without the cost of construction! ← Big ol’ bowl of coleslaw. This makes such a huge impact on the room! I would love to do something similar. I have done this very thing with a window centered on THE ONE WALL of a bedroom where the bed could nicely fit. Just hung an 8′ rod, hung enough curtains (2 sets of 2 panels) to cover an area at least a foot beyond each edge of the bed, and it looked like the bed backed up against a huge, centered window (window as 36″x48″ or so). This was not my idea, but that of a dear friend, when asked what I could do with the terrible window placement. It works! I’ve used it other times, now that this issue has been resolved in my brain! One of my favorite solutions are Roman shades. They can also be combined with curtains or used as the sole treatment on a window. Also, both methods can be used in the same room. One wall of my bedroom has a triple window. I intend to use Roman shades with drapes. One adjoining wall has a wood and glass door to the deck. The other wall has a single window. For the single window and the door I am using only the Roman shade. I’ve seen this done in rooms and love the effect. It also works well as an answer to a situation like mine where a door or odd sized window is involved. These shades can be a great solution for those having radiator or baseboard heat under your windows.